Notre Dame coach Brian Kelly entered the 2017 season on the hot seat after a 4-8 outing the year prior, but the Irish bounced back with a 10-3 record, capped with a Citrus Bowl victory against LSU. The Irish, however, didn’t make the College Football Playoff. 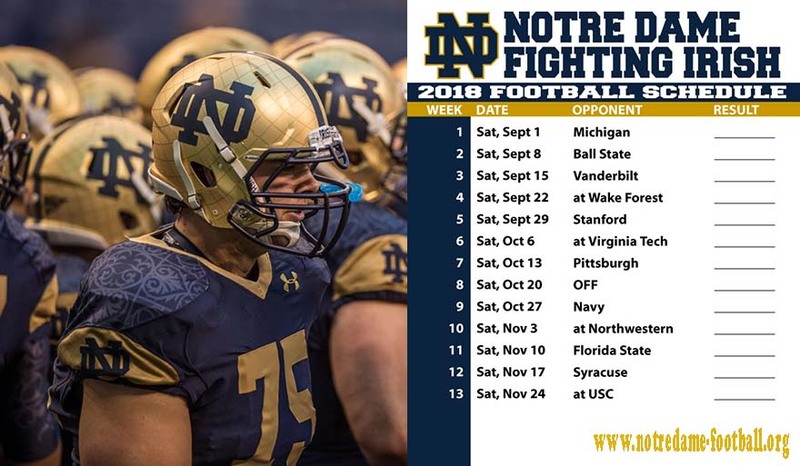 Notre Dame lost by one point to Georgia and suffered November losses to Miami and Stanford. That margin for error remains small — smaller than most teams’ — without a conference championship game and a difficult schedule. There’s still reason for optimism in 2018, however: Offensive coordinator Chip Long is back, and Kelly, entering his ninth season, has the Irish in position for another season of double-digit victories. April 21 Blue-Gold Spring Game Notre Dame, Ind. Sept. 1 No. 17 Michigan Notre Dame, Ind. Sept. 8 Ball State Notre Dame, Ind. Sept. 15 Vanderbilt Notre Dame, Ind. Sept. 22 at Wake Forest Winston-Salem, N.C.
Sept. 29 No. 14 Stanford Notre Dame, Ind. Oct. 6 at No. 15 Virginia Tech Blacksburg, Va.
Oct. 13 Pittsburgh Notre Dame, Ind. Nov. 3 at Northwestern Evanston, Ill.
Nov. 10 No. 19 Florida State Notre Dame, Ind. Nov. 17 Syracuse Bronx, N.Y.
Notre Dame had the No. 10 recruiting class according to 247Sports’ Composite team rankings. Kelly pieced together a class built around four-star cornerback Houston Griffith from IMG Academy and receiver Kevin Austin of North Broward Prep in Pompano Beach, Fla. Kelly hasn’t lost his touch in selling the Irish as a national brand, and it shows with this class. 1. Who is the QB? Brandon Wimbush (1,870 yards, 16 touchdowns, six interceptions) started for most of last season and led the team with 14 rushing touchdowns. Wimbush, however, had a 49.5 completions percentage, allowing backup Ian Book to get a look in the Citrus Bowl. Book played well in that game, completing 14 of 19 passes for 163 yards and two touchdowns, but also threw four interceptions in just 75 attempts last season. Kelly consistently shuffles quarterbacks at Notre Dame, and this season looks to be no different. Wimbush needs to be more efficient; Book can’t turn the ball over. Those factors will determine how this competition unfolds. 2. Will the running game be as dominant? Notre Dame ranked seventh in the FBS with 269.3 rushing yards per game in 2017, but there are holes to fill on offense. Running back Josh Adams left for the NFL, along with All-American offensive linemen Quenton Nelson and Mike McGlinchey. Offensive line coach Harry Hiestand took the same position with the NFL’s Chicago Bears. Jeff Quinn takes over that position and will shuffle the line in the spring, but running backs Dexter Williams and Tony Jones Jr. are back. The rushing attack should be formidable again. 3. Can the Irish force Playoff discussions again? Perception is everything at Notre Dame, and the program did have wins vacated from the 2012 and 2013 season after the NCAA denied its appeal. With that, Kelly is now 48-34 at Notre Dame — by the book. The Irish have won 10 games in two of the last three seasons, and were in the Playoff hunt until late-season losses derailed those hopes. Notre Dame can’t lose two games and make the Playoff, but a one-loss Irish team would force a heated discussion. Will this be the year the Irish do it?